The month of June is a favorite date for weddings. 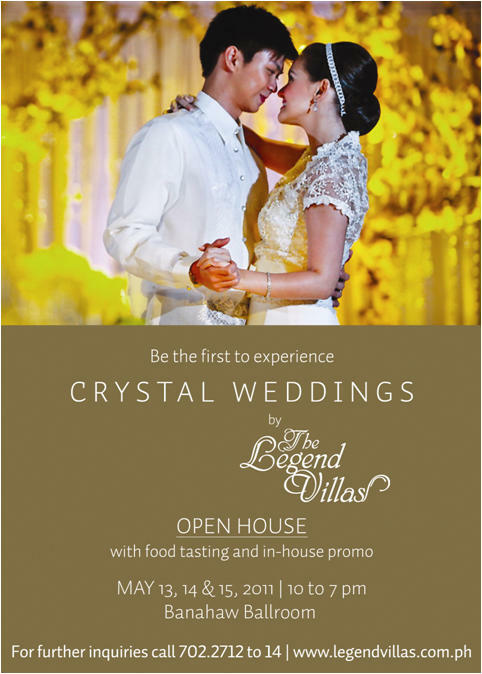 To help couples meet with event organizers and suppliers, The Legend Villas is holding the Crystal Weddings Open House from May 13 to 15, 2011 from 10 a.m. to 7 p.m.. The event will also showcase the hotel's unique Crystal Wedding themes -- the magical Quartz and sophisticated Onyx. The Quartz package is ideal for couples who prefer a fairytale-themed wedding. The classical table setting reflects timeless elegance while the luminous decor accentuates an aura of magical merriment. Stylish and chic, the Onyx package is meant for couples who want to veer from the traditional wedding motifs. The black and white set-up evokes a hip atmosphere of drama and high class. Starting at Php 155k for 100 persons, The Legend Villas Crystal Wedding packages guarantee couples and their guests of a wedding that that has top-notch service, a stylish set-up, and a sumptuous feast. The Legend Villas is located along Pioneer Street in Mandaluyong City. For inquiries, interested parties may call Banquet Sales Office at 702-2712 to 14 or visit www.legendvillas.com.ph. Great post! This is great news to people who are getting married soon. Keep posting for more.